It's been two years since Alexander "Xander" Lee Eusebio launched his career as a solo artist after his stint as an original member of K-pop boy band U-KISS ended in March 2011. He found himself at a crossroad at the time, thinking very hard even if he would continue his career or not. But he decided to pursue what he did best and discovered many new things along the way. Xander met the Philippine press on July 26 at the K-Pub BBQ at the BGC Fort Strip in Taguig to talk about his new career and projects. The 24-year-old singer, entertainer and actor is in the Philippines for his "Alexander Fan Party in Manila," presented by Fangirlasia.com and sponsored by K-Fest Manila Events Management, which will be held today, July 27, at the SM Megamall Cinema 4. This is his fourth visit to the Philippines and his first as a solo artist. In 2010, U-KISS visited the country three times for promo tour and concerts. In an interview with Bulletin Entertainment, Xander talked about his newfound career, U-KISS and his upcoming activities. He said going back to the Philippines made him feel edgy. "I'm very nervous. It was three years since the last time I came back and I felt a warm welcome so I'm really happy. I'm always worried about whether my fans would still be around," he said. Xander debuted in U-KISS in 2008. After three years, Xander and Kim Kibum parted ways with the group. When his career with U-KISS ended in March 2011, Xander said he pondered on his next move. "Afterwards, I was really struggling whether I should continue or not in showbiz because it was really a tough thing. I've decided to continue because I don't like giving up something I've already given up," he told Bulletin Entertainment. He decided for himself that being in showbiz was his calling and his family was there to support him. "My family didn't force me but they would advice me. They would say, 'If it's too hard for you, just go back to studying or anything you want' because they love me. But they were saying 'Of course it would be good if you don't give up.' They just hoped that I would choose something that I'm happy, I'm comfortable with. But I know I won't be comfortable [in being a solo artist]. I know it would be a hard road but I decided to keep going," he said. In August 2011, he held his first solo fan meeting in Hong Kong. That same year, he released his first single "I Just," which was his first major project as a solo artist. "The first plan was actually my first single. It was really hard because I finally know how hard it is to be solo artist. I cried a lot, suffered a lot and training was really hard. I've now become much stronger and I'm learning about showbiz really well. I didn't know that being solo it not only about work but also about business," Xander said. While he is enjoying as a solo performer, there are times when he misses being in a boy band as far as workload is concerned. "There are times I am this when being a solo artist especially, you know, the workload. When I was in U-KISS, [we would be] separating the workload. People would just take turns to answer the questions and even on stage when I perform, each one would have like different parts. Now being solo, sometimes I wish [someone] would help me with the workload. But it makes me stronger and more independent," he said. 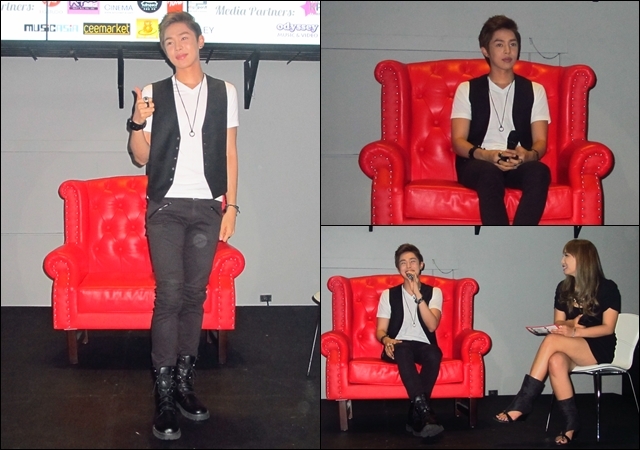 Since 2011, Xander has held fan meetings in Japan, Malaysia and Singapore. He has also ventured into acting. In November, fans will see Xander act in his first movie "3 Peas in a Pod," which was directed by Singaporean actress-turned-director Michelle Chong. Xander will be starring in the film along with Calvin Chen, a member of Taiwanese boy band Fahrenheit, and new actress Jae Liew. "3 Peas in a Pod" is a story about the lives of three friends. The movie was shot in Australia and Singapore for one month early this year. Xander said his foray into acting was very hard. "It was difficult. Acting is really hard because it's my first lead role. Like singing, acting is more complicating. I thought happy is happy, sad is sad. I never thought about complex emotions like can you act happy when you're sad actually? No. It was really difficult. I'm glad that Michelle, the director, taught me a lot. I'm really blessed. Normally if it's my first lead role and I don't do well then I'll be like stressed and cry a lot but Michelle is so supportive," he said. The movie will premiere in Singapore in November. Having experienced acting, Xander says he wants to play more roles. "I wanna do acting a lot. It's really hard and I want to challenge it," he said. He added that there were some offers for roles in Singapore but he said, "I wanna focus more on the movie first and see how it did." Xander said he would love to do Hong Kong movie since he is fluent in Cantonese. For the rest of the year, Xander said he will be "travelling a lot" with visits to Indonesia and Canada for a K-pop event. Despite that he is no longer with U-KISS, Xander keeps in touch with the group. "At the end of 2012, they had a big gathering. I visited my boss and I didn't know they were having a end-of-the-year party so we went to dinner together. Nowadays, we are too busy so we don't really contact each other. It's just mostly happy birthday or messages," he said. Among U-KISS, Xander said he's in contact regularly with new member Hoon, who was also a solo artist before joining the group. If he is given a choice to join a boy band again, Xander said he would stick to his solo career. "No thank you," he said in jest. "I'll be happy to but being in a group, I already did this. I want to try something that I could do as a solo artist. Maybe when I'm tired of being a solo artist."